Displaying more color intervals than traditional four-color radars, the Doppler-enabled GWX 75 radar helps take the guesswork out of real-time weather tracking and analysis. The additional colors provide a far more nuanced interpretation of storm cell dynamics. 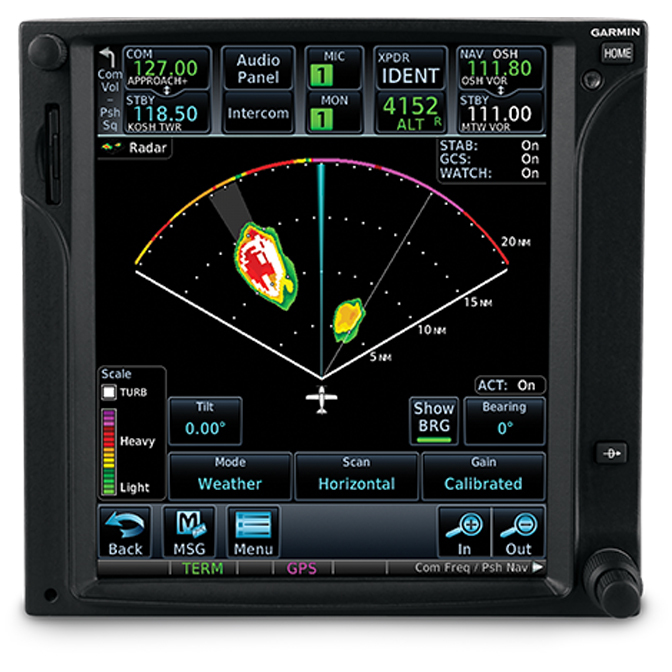 Plus, this high-definition target contouring combines with exceptional range and adjustable scanning profiles — both horizontal and vertical — to allow you to more accurately assess a storm threat via your compatible flight deck or multifunction display. 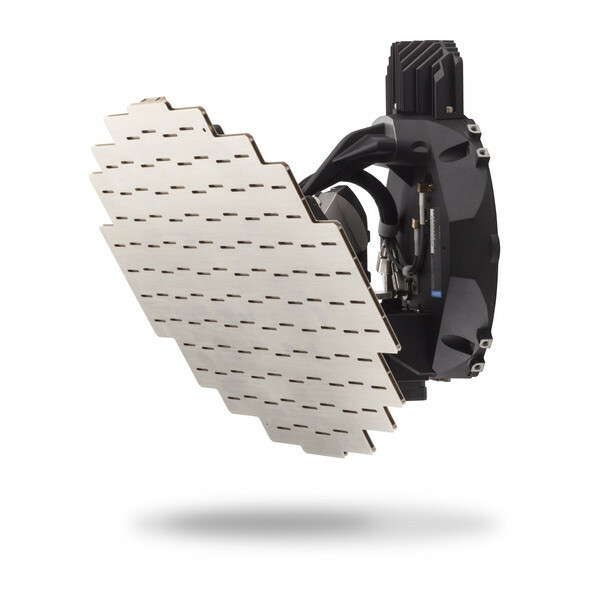 The fully stabilized GWX 75 offers horizontal scan angles up to 120 degrees to locate and evaluate convective weather activity. The radar’s vertical scanning mode aids in analyzing storm tops, gradients and cell buildups at various altitudes. In addition, our Weather Attenuated Color Highlight (WATCH®) technology helps identify the shadowing effects of short-range cell activity — highlighting areas where radar signals are weakened, or attenuated, by intense precipitation (or large areas of lesser precipitation) and may not fully reflect the “storm behind the storm.” With these capabilities, the GWX 75 radar makes it easier to scan large geographic areas and make sound weather-related decisions. Plus, a handy ground mapping mode lets you use GWX 75 to scan terrain features for visual navigation. To enhance the capabilities of GWX 75, available options include turbulence detection and ground clutter suppression. With ground clutter suppression, the GWX 75 radar provides a more consistent, more accurate view of weather at all altitudes and all ranges by identifying areas of ground and surface features. The result is a cleaner, clearer image that lets you focus on real weather. Likewise, optional turbulence detection technology can be used to determine areas of rough air — so you can make tactical routing decisions that avoid flying into hazardous conditions. With its digital design, the GWX 75 system offers reduced power consumption and extended service life, as compared to previous generations of magnetron-based radars. While magnetron tubes degrade or burn out over time, the solid-state technology in GWX 75 maintains a consistent weather picture over its entire life cycle — all while using only 40 W of transmission power. 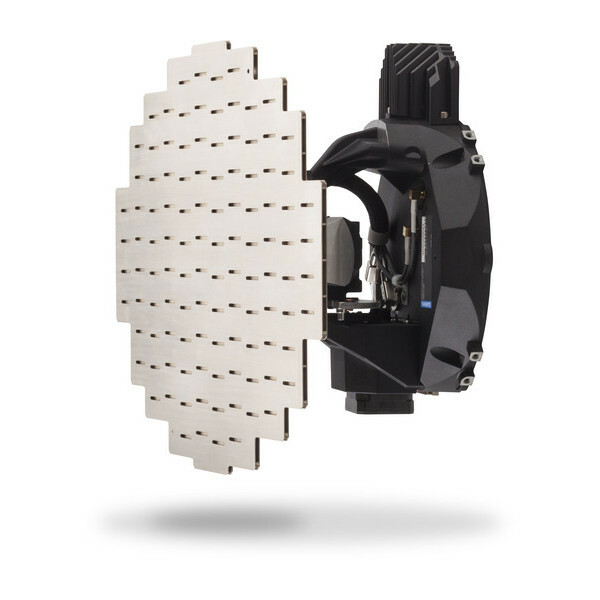 The weight-saving, all-in-one antenna/receiver/transmitter unit is available with 10” or 12” phased array antenna plates, so GWX 75 onboard radar capability can be adapted to a variety of aircraft radome configurations. Operating Temperature Range: -55°C to +70°C.